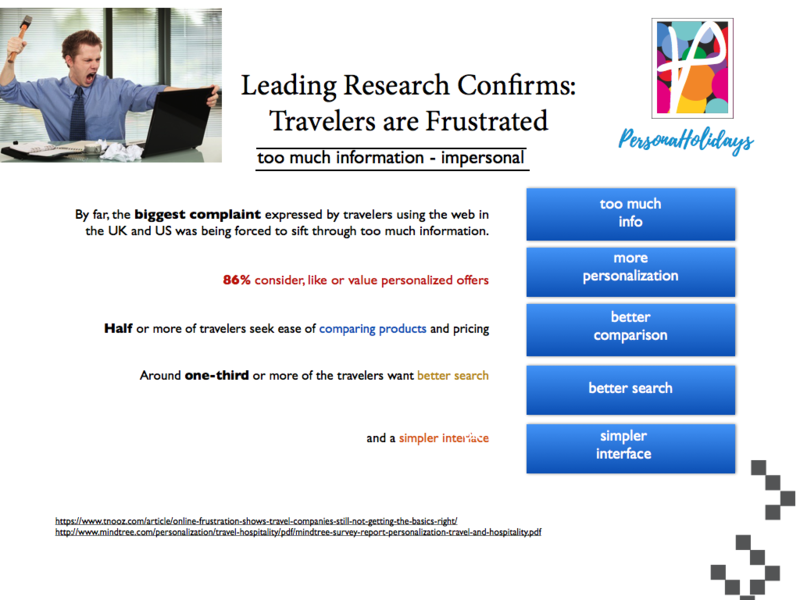 It has to be fairly self evident that travelers are looking for authentic personal experiences and the biggest complain in leading surveys tells us that the number one complaint is their is just too much information. Actually the problem is not that there is too much data but that it is not filtered correctly. Yes it is important to be ably to filter by location, price and facilities, but these are getting to be very much the same and often is not the deciding factor. Getting a personal recommendation based on personal needs is what makes the difference. Booking engines and travel planning are failing in several other respects also. They are slow and not intuitive or visual. all these are where Personaholidays shines. All this leaves room for improvements in personalization, more targeted information and better systems. Travelers are ready for a better way! In the next section we will demonstrate the PersonaHolidays Systems and show how travel can be fin faxt and personally relevant. Our next job is to look at what is happening to hotels and tourism operators as a result of the growing dominance of Online Travel agents OTAs that tend to regard rooms and places as a commodity >>>>>. Contact us to see how PersonaHoliday might help your businesses.